Romona Robinson is an eight-time Emmy Award-winning journalist with thirty years of public speaking experience. 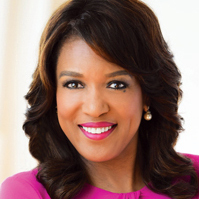 She is currently an anchor at WOIO in Cleveland and broke barriers by becoming Cleveland’s first black female primary anchor and the city’s first female solo evening anchor. She has earned several prestigious awards, including the Edward R. Murrow Award, the YWCA's Women of Achievement Award, and the Diversity in Media Award. Romona has singularly devoted herself to issues of diversity and child advocacy and strives to help others by sharing messages of faith, hope, and purpose. She holds a Bachelor of Science degree in broadcast journalism and currently resides in Cleveland, Ohio with her husband and their pooch, Soldier.